The small County of Põlva (area 2164 sq km, population 34,270) with its beautiful scenery is a destination offering new discoveries over and over again for many. It offers peace and tranquility, the mystery of rivers full of rapids, and the easy hospitality of the country folk. The County of Põlva is not big, but it has a diverse landscape and culture. 1. 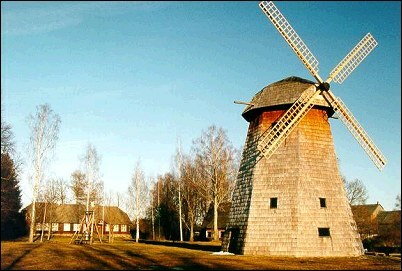 Põlva Peasantry Museum is located in the Village of Karilatsi, along the ancient Tartu-Võru Postal Road. The typical building developed here on the site of the centre of a parish at the end of the 19th century. On the area of 5 ha you can see the Courthouse, Schoolhouse, Parish House with outbuildings, Smiths' Farmhouse and a Dutch windmill. Old agricultural machines and vehicles are also exhibited here. 2. 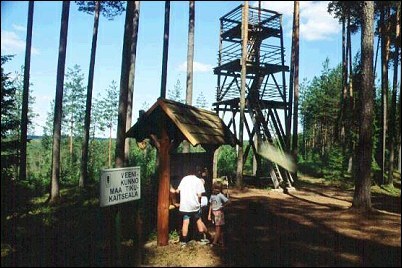 The spur of the Small Taevaskoja is about 190 meters long and 13 meters high. The Emaläte (Mother's Spring) streams out from the upstream edge of the spur. Spring waters have grooved a big cave into the spur. It is called the Neitsikoobas (Maiden's Cave), of which people have created numerous legends. 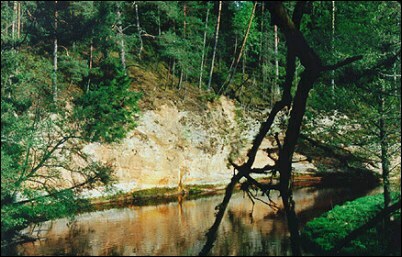 The highest outcrop of the River Ahja is the spur of Big Taevaskoja, the maximum height of which is 24 meters. 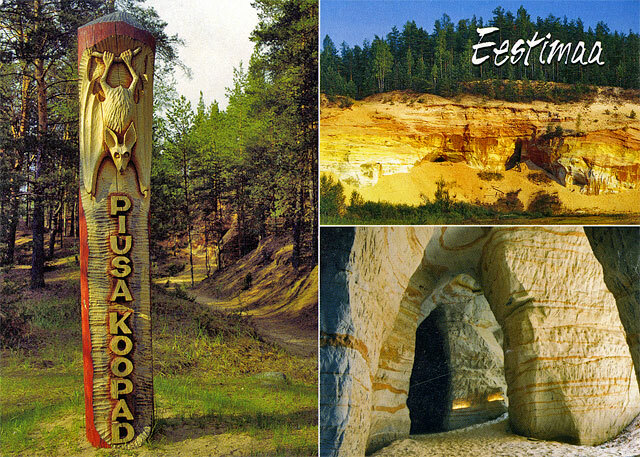 The Big Taevaskoja used to be a sacrificing place in the old days. On the edge there is a big boulder called Nõiakivi (Witch Rock) or Salakuulaja Rock (Spy Rock). 3. The Ants' Kingdom in Akste, the biggest colony of ants in Estonia, has over 3 billion "inhabitants". About 1500 nests communicating and connected with each other by the tracks of forest ants are located here. Forest ants are the most developed social insects and they create the biggest communes. The ant society is similar to the human society: nest systems of complex hierarchical structure with the exchange of information and goods, division of labour, wars, family life of complex organisation and architecture of a high quality. It is advisable to visit the Ant's Kingdom in Akste with a guide and groups should agree the visit with the environmental service in advance. 4. The Tilleorg Landscape Reserve is situated on the historical Tartu-Võru Postal Road. The River Ahja is also called the Tille River in its upper course and in the Tilleorg the young river develops from a small rill running out of Lake Erastvere , in some places it is 10 meters wide and 2 meters deep. The riverbed meanders and creates many crooks and turns. The "Pearl" of the Landscape Reserve is a vertical dark red sandstone wall on the right bank of the Varbuse Brook, in the Western edge of Tilleorg, and the Merioone Spring, streaming from a cave in the wall, with a discharge of 16 to 23 liters per second. 5. Meenikunno is a relatively young marsh, therefore many bog islands can be found here, the biggest of which are Kamarusmägi, Tundipalu Mounts and Pikksaar. On the edge of the marsh there is an observation tower, from where the nature trail - a 2.5km long plank road - starts. The track, provided with information boards, passes through the different types of bogs and by bog lakes. Two lakes of totally different characters are situated here, close to each other: Lake Valgejärv is considered to be the lake with the clearest water in Estonia. In summertime the transparency of the water is up to 8 meters. Lake Mustjärv, located close by, is again one of the lakes with the darkest water in Estonia. 6. The River Võhandu is the longest river in Estonia - 156km, with its source in the Otepää Upland, near the Village of Sirvaste. The oldest part of the River from the Leevi Mill Dam to the Bridge of Reo is under natural protection. The protection area is 12km long and covers 300 meters of the landscape from each bank. Of the 38 outcrops in the protection area the biggest and most fascinating are Põdramüür (16.2m of height), Viira veskimüür (16.5m), Sojatare, Kalmate rnüür and the highest of all Tsirgu müür (17.1m). Of the many springs the most peculiar one is Maraläte (laying bare up to 9 meters of sandstone). 7. Põrguhaud, Sügavhaud and Kuradihaud belong to the group of the llumetsa Meteor Craters. 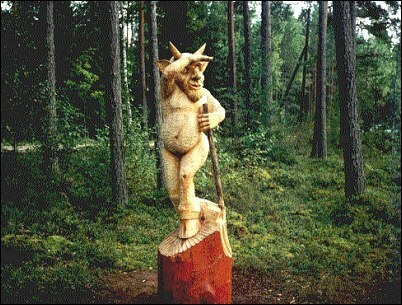 To reach the Craters you have to step over the still of the Gates of Hell, then funny wooden devils will greet you. 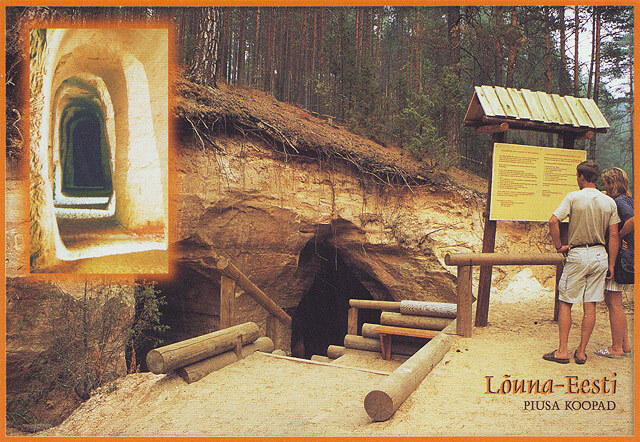 Walking along the plank road you will get to the Põrguhaud (Grave of Hell), which is the biggest of the craters. The Sügavhaud (Deep Grave) is situated a further 900m to the South and the third tip of the triangle is the Kuradihaud (Grave of the Devil), usually filled with water. 8. The Trade Route of Tartu - Pihkva and the River Võhandu and Lake Lämmijarv attracted people to inhabit this remote area besides the forests and bogs, as early as the 13th century. The factory settlement of Räpina was set on the River Võhandu, next to the former manor, church and paper factory already there in the 18th century. Today the Town of Räpina is a garden town with a safe, friendly and picturesque environment and approximatly 3000 inhabitants. The Classical-style Manor Sillapea (1842) together with a well-designed park, formal gardens and a reservoir creates one of the most beautiful manor estates in Estonia. There are more than 300 sorts of trees and bushes in the Park. Around Räpina is a hiking trail, which introduces the traveler to the interesting history and fascinating nature of the area. 9. One part of Setumaa belongs to the South-Eastern part of the County of Põlva. Setu people are a peculiar national guild of the Baltic Sea region, which, living under the reign of the Russian Czar Empire, succeeded in maintaining their ancient language and traditions. It is advisable to visit Setumaa, when some traditional Setu celebrations take place. 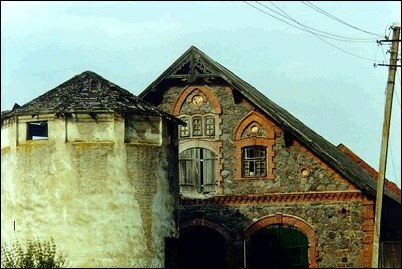 In the Setu Farmhouse Museum you can find out about farm architecture, old tools and rich handicraft of the Setu origin. In addition the variable thematic exhibitions are held all year round: from old to new, from handicraft to art, from archaeology to modern day. Folklore nights are organised and Setu anniversaries celebrated in the Museum; there is also the opportunity to participate in farmhouse work and cooking. Setu cottage cheese is worth tasting and the local moonshine is powerful! 10. Piusa Caves are situated in the Parish of Orava in the left slope of the ancient Valley of the River Piusa, near Piusa Railway Station on the Valga-Petseri railway. 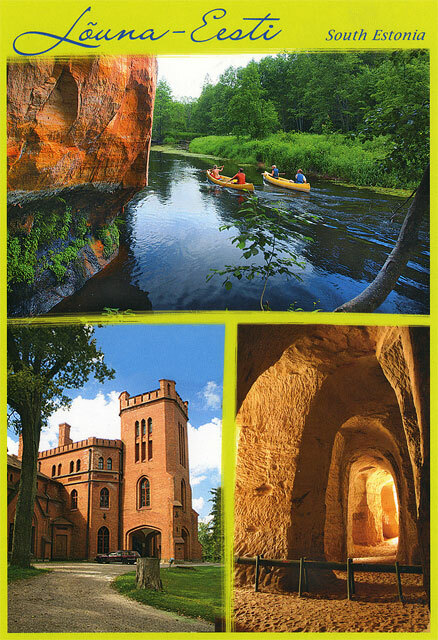 The Caves have been formed a consequence of the digging of glass sand by hand in the years 1922-1966 and are a system of passages with arched ceilings and sandstone columns. There is a 1.4km study trail, which aims to introduce the ecosystem of the heath forest, typical of the surroundings of the Caves, and to offer hiking opportunities in the curative air of the pine forest. 11, 12. The Russian Old Believers (Raskolnik) is an interesting national group of this region. The small Villages of Beresje and Lüübnitsa on the shore of Lake Pihkva have a totally different architecture and village lifestyle from the traditional in Estonia. Fishing boats puff on lake, small herrings dry under the roof of houses, and onions are grown in fields instead of potatoes. 13. Erastvere is one of the settlements in the surrounding area. In the Village of Magari, 3km before Erastvere, a commemoration stone located beside the road marks a battlefield of the North War; the Erastvere Battle between the Swedes and Russians took place here in 1701. 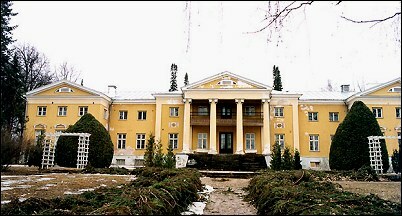 A 35m high lime-tree, the highest among this species in Estonia, grows in the old Manor Park of Erastvere. 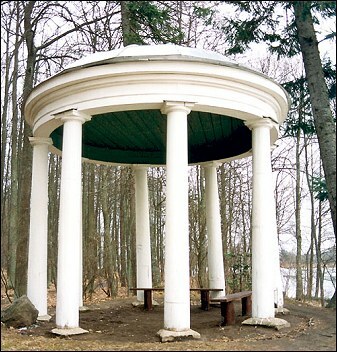 In the centre of the park, on the foundation of former Marie Church, a Chapel of the family of the German Barons von Ungern-Stemberg, was built, bearing the name of Gerhard - the last member of the family borne in Estonia. The fascinating Lake Erastvere is located near the Park. 14. 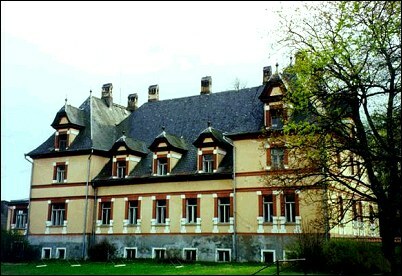 The Manor of Mooste dates back to the end of the 16th century. The majestic manor complex was built in 1909 in the Jugendstil and Historicist style. In the interior, the vestibule, furnished with a gallery rising through two stories, catches the eye. The surrounding park, which is built in the English style, makes the Manor impressive. From all of the avenues a beautiful view opens to Lake Mooste.